The ultimate wardrobe staple, jeans are a blank canvas for trends. This season, classic denim gets an update with intricate embroidery, while ripped jeans and distressed denim remain a key trend. 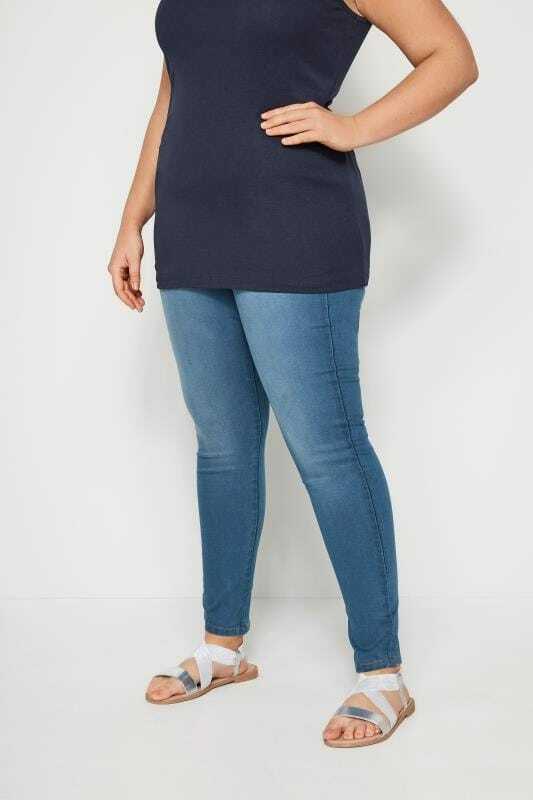 Crafted from a comfortable stretch fabric, our collection of plus size jeans effortlessly combine fashion and function in a selection of shapes and cuts. Shop the range in sizes 16 to 36 below. Looking for hot new denim? Check out our range of plus size jeans for this season’s latest styles. From classic skinny jeans to slouchy boyfriend fit, choose from plain denim, embroidered styles or ripped jeans to find your perfect look. Isla is our bootcut jean. In a flattering mid-rise shape, this style features a slight flare to the hem. Flattering and easy to dress up, it’s a day-to-night staple. Brooklyn is our boyfriend jean. Designed to give a relaxed, slouchy fit, it’s the ultimate throw-on-and-go for instantly effortless style. Ava is our best-selling skinny jean. Super flattering and totally versatile, this is your go-to for timeless fashion. Stay low-key with sneakers and your favourite t-shirt, or style-up with platforms… the possibilities are endless. Ruby is our straight leg jean. Effortlessly on-trend, this style is a wardrobe staple. Designed to give a more relaxed look, partner with an oversized t-shirt for a contemporary casual look. Jenny is our jegging. Combining fashion and function, this style is an ultra-comfortable everyday staple. In a super stretch fabric, it features a flattering high waist and an elasticated waistband. Lola is our shaper jegging. Crafted from a super stretch fabric, this style features innovative seam details to gently sculpt your figure and flatter your shape. Effortlessly stylish, it can be worn as part of your casual or evening wardrobe.